A three-year old girl survived on bread and butter for up to four days after her mother killed herself, an inquest has heard. 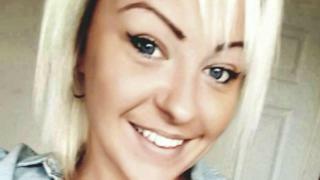 Aimee Louise Evans, 28, was found hanged at her home in Dalton Road, Port Talbot, by police on 7 April. After the mother-of-two's death, police believe her daughter, who was found looking "unkempt", had survived by eating loaves of bread and some butter. Senior coroner Colin Phillips recorded a verdict of suicide. Ms Evans's daughter was taken to hospital to be examined by a paediatrician as soon as police found her, the inquest at Swansea Civic Centre was told. PC Clive Morris said Ms Evans sent a text message to her mum, Julie Evans, on 4 April asking her to collect her daughter because she was "ending it". Her son was staying with his father in the Bridgend area at the time. Julie Evans replied to her daughter and said "do not be daft" and asked what was the matter. The inquest heard that was the last time she heard from her daughter despite repeatedly trying to make contact over the following days, including visiting the house. PC Morris said there were no suspicious circumstances surrounding Ms Evans's death, adding that she had no history of mental health problems. The inquest heard Ms Evans used to drink most evenings and had been the victim of domestic violence in previous relationships. Toxicology reports revealed Ms Evans's blood alcohol level was up to 216mg of alcohol per 100ml of blood at the time of her death - the legal limit to drive is 80mg of alcohol per 100ml of blood. PC Morris said: "This is one of the hardest cases I have dealt with." Speaking after the inquest, Ms Evans's friend Charlene Coulter said: "Aimee was a fun-loving girl who had the biggest heart - she would go out of her way to help anyone and often wore her heart on her sleeve.